2013 Conference on Disarmament. UN Photo/Jean-Marc Ferré. International scrutiny of the North Korean and Iranian nuclear programs always has a strong legal dimension. But just how far do legal obligations extend? North Korea’s latest nuclear test came just days after the Security Council indicated in Resolution 2087 that it would be willing to take significant actions in the event of a further North Korean nuclear test. The Security Council’s response to the test came on 7 March with a China-backed resolution that strengthened UN sanctions. In the case of Iran, Western countries contend that Iran’s failure to disclose the construction of enrichment facilities is in contravention of its obligation under the Treaty on the Non-Proliferation of Nuclear Weapons (NPT) and its Safeguards Agreement. Iran, on the other hand, relies on NPT Article 4(1) and insists on its right to enrich uranium for peaceful purposes. In January, Oxford scholar Dapo Akande posed the following question on the website of the European Journal of International Law: if Iran withdrew from the NPT, would the Security Council be legally justified to impose on Iran, through a Chapter VII resolution, obligations contained in the NPT and the Safeguards Agreement? The Security Council has already determined implicitly, in a series of resolutions adopted under Chapter VII, that the Iranian nuclear program constitutes a threat to international peace and security. So a priori, there would be nothing to prevent the Council from imposing obligations contained in the NPT on Iran. Thus, even as a non-party to the NPT, Iran may continue to be subject to the same obligations, since decisions taken under Chapter VII are binding on all UN member states. Respect for national sovereignty and the consensual nature of treaty obligations lies at the heart of the question. While the letter of the UN Charter suggests that the Council would be empowered to impose NPT treaty obligations on Iran, this would clash with that country’s expressed will not to be bound by NPT obligations. This would not be the first time the Security Council had imposed treaty-like obligations on states. As Vera Gowlland-Debbas noted in a recent paper, in the last decade the Security Council has become increasingly involved in the law-making ‘industry’ through Chapter VII resolutions, especially in the area of non-proliferation. Some of these resolutions have practically copied and pasted treaty obligations into Security Council resolutions that are now binding on states not party to these agreements (prominent examples include resolutions 1373 and 1540). In country-specific cases,resolutions 1718 and 1874 on North Korea are examples of resolutions imposing treaty obligations on non-parties. North Korea withdrew from the NPT in 2002. Yet following North Korea’s nuclear test in 2006, the Security Council demanded that it act in accordance with the obligations of the NPT and the Safeguards Agreement. North Korea’s latest nuclear test calls into question the effectiveness of that approach. 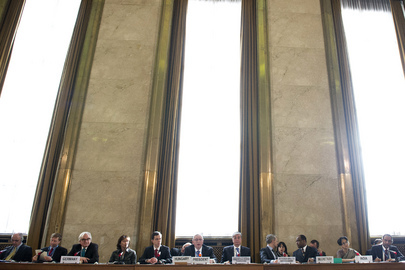 While some of these decisions may have been justified from the standpoint of maintaining international peace and security, the composition of the Security Council, the risk of double standards and the lack of transparency in its decision-making process casts a shadow on this recent practice of enforcing unendorsed treaty obligations through Article 39 of the UN Charter and the determination of a threat to international peace and security. This is further complicated by the fact that the Security Council’s understanding of what constitutes a threat to international peace and security has become increasingly broad in the last two decades. ← Intervention in Libya: Another Nail in the Coffin for the Responsibility-to-Protect?